LaMarcus Aldridge is heading to the San Antonio Spurs in the biggest move of the NBA off-season. It took eight seasons and a miracle buzzer-beater, but LaMarcus Aldridge was finally out of the first round of the playoffs. Portland's All-Star forward was playing the best basketball of his career, topping 40 points in back-to-back games in the first round, taking command of games. A career's work went into that series victory, years spent shouldering the burden of losing Brandon Roy and Greg Oden, and it was easy to read the happiness, the relief and the sense of accomplishment on the usually reserved Aldridge's face. Finally, a taste of success and the promise of more. Within a week, those feelings were gone, wiped away by humbling blowout losses to the Spurs in the second round. Game 1 was a 24-point defeat in which Aldridge's 32 points and 14 rebounds weren't enough to keep it competitive. Game 2 was a 17-point loss that saw Portland picked apart again as Aldridge's shooting touch deserted him. The Blazers, who stumbled upon a snake in the AT&T Center's visitor's locker room before Game 2, looked shaken by the stage. Yet Aldridge did his best to hold things together, declaring that Game 3 in Portland would be the "biggest game of the postseason" and that a win would help "shift some of this momentum." Instead, the Spurs smacked the Blazers for a third straight time, winning by 15 and continuing a roll that wouldn't stop until they were 2014 champions. Aldridge, his season all but technically over and his first postseason series victory brushed aside by San Antonio's winning machine, sounded flummoxed, even awed, as he explained how overwhelming it was to face coach Gregg Popovich's disciplined, experienced and unselfish team. "They never stop playing," Aldridge said. "If you guard their first option, they've got a second option. If you guard their second option, they've got a third option. They're persistent. They're not going to change. They're going to run their stuff over and over and over. Once you mess up, they're going to make you pay. They ran their offense, if we tried to cheat something, they ran a backdoor. We give up an offensive rebound, they make a big three. They're consistent, they play championship basketball." On July 4, Aldridge became one of Popovich's options, agreeing to sign a four-year, $80 million maximum contract that returns him to his home state of Texas. The decision ends one of the greatest careers in Blazers history, a nine-year span that saw Aldridge make four All-Star games and three All-NBA teams, while ranking second in franchise history in points and third in minutes played. But that run, spanning nearly a decade, ends with only that one playoff series win, as the Blazers, who never recovered after losing Wesley Matthews to a torn Achilles, were ushered out of the 2015 postseason in short order by the Grizzlies. Aldridge wasn't particularly effective in the series, and he no longer contained—or cared to contain—his frustration. He was about to turn 30, he had spent the last five years as a workhorse, and he had precious little to show for it. The future—with Matthews injured, with Robin Lopez set for free agency, with All-Star point guard Damian Lillard ready to be the face of a team, with yet another weak bench on deck—didn't offer anything in the way of consolation as Aldridge entered unrestricted free agency for the first time in his career. The Blazers spent the better part of the last few years preparing for Aldridge's decision, and it was a road that took many turns. On multiple occasions, Aldridge publicly floated his desire to remain with the organization for his entire career in hopes of supplanting longtime franchise icon Clyde Drexler in the record books. At other times, Aldridge's frustration with the team's lack of postseason success and his lack of personal recognition seeped out. In 2013, Aldridge used his exit interview to try to set the franchise's bar higher than just making the playoffs, and the All-Star selection process was a regular bone of contention. First, Aldridge felt snubbed when he was left off the team in 2011, then he felt snubbed when he was selected but only given short minutes in 2012, and then he felt the snubbed because he wasn't voted in as a starter in 2014. This year, Aldridge suggested that perhaps playing in small-market Portland had dimmed his light, and that maybe his 23.8-point, 10.4-rebound averages would get more national attention if he played in a bigger market. The Blazers responded by presenting Aldridge with a series of plaques recognizing his achievements in the franchise record books in an attempt to reassure him that he wasn't taken for granted. But what was really motivating him? Attention? Money? Winning? A change of scenery? A better supporting cast? The attention was certainly there this week. Aldridge met with a series of suitors—some, like the Lakers, twice—as he finally got his moment in the sun. Everyone from Pat Riley to Kobe Bryant to Tim Duncan courted him, and after years of feeling overshadowed by Blake Griffin and Kevin Love, it was he, Aldridge, that was this summer's prized commodity. Popovich and Duncan surely brought their A-game during the recruitment, but memories of the 2014 playoffs had to loom large. That series was the pinnacle of Portland's decade and just another run for San Antonio. That series saw Aldridge struggle to find help, while Duncan and company didn't skip a beat, even when Tony Parker went down late in the series. That series saw the triumph of depth over youth and, as Aldridge noted, reinforced the value of structure and continuity. Surveying his options this summer, San Antonio held the lead in those categories by a mile. The Blazers broke up their starting lineup by trading Nicolas Batum, and both Matthews and Lopez are now headed elsewhere, and GM Neil Olshey's blustery roster-upgrading promises often resulted in mundane moves. The Lakers are stuck in a past-meets-future identity crisis: waiting for Bryant to retire and then waiting again to see whether the D'Angelo Russell/Julius Randle pairing can be something. The Suns have churned through players at a shocking rate in recent years, and their young backcourt of Brandon Knight and Eric Bledsoe offers only promise, not proven results. The Knicks couldn't even get a meeting: If there was pecking order tension with Lillard in Portland—and there definitely was—just imagine how a Carmelo Anthony/Aldridge partnership would work out. The Mavericks already have a franchise power forward in Dirk Nowitzki who is still flickering; DeAndre Jordan, a rim-protecting, alley-oop finishing center, will make a much more natural pair with Nowitzki than Aldridge, who has repeatedly insisted he doesn't want to play the five. Although the Spurs do face the age question with Duncan, Manu Ginobili and Tony Parker, they have very strong answers to everything else. Winning? The core of that dominant 2014 team is still intact and anxious to atone for a surprising first-round exit against the Clippers. Money? Spurs GM R.C. Buford carved out max money for Aldridge by trading away Tiago Splitter and offered a player option in the fourth year, so Aldridge can reap the rewards of the increasing salary cap in 2018. A change of scenery? Aldridge heads back to his home state, where he spent two years up the road in Austin at the University of Texas. Help? Duncan's minutes started to drop in his age 31 season, as Popovich masterfully shifted responsibilities and altered schemes to extend his franchise player's career. Aldridge's load, in terms of minutes and scoring responsibility, is bound to be lightened and his efficiency numbers should benefit as a result. Recognition? Aldridge lines up alongside Duncan, Kawhi Leonard and Parker, three lower-profile stars who have rings and Finals MVP awards, which sure beat All-Star votes and franchise record plaques. History? Aldridge becomes the biggest free-agent addition of the Popovich era, and he gets the opportunity to take the baton from Duncan like Duncan once did from David Robinson. That last factor really shouldn't be overlooked. Aldridge has consistently expressed the highest level of respect for Duncan during his career, once citing the opportunity to be around the future first-ballot Hall of Famer as the highlight of his All-Star experience. 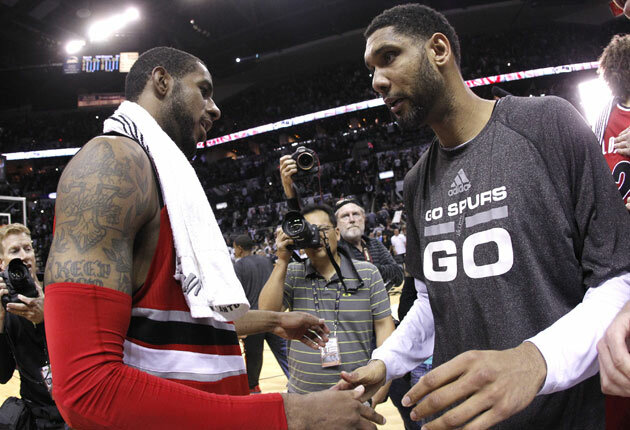 Once, Aldridge marveled at Duncan's staying power, and used the word "ancient." A reporter picked at the word, trying to see if perhaps Aldridge meant to suggest that Duncan was fading. 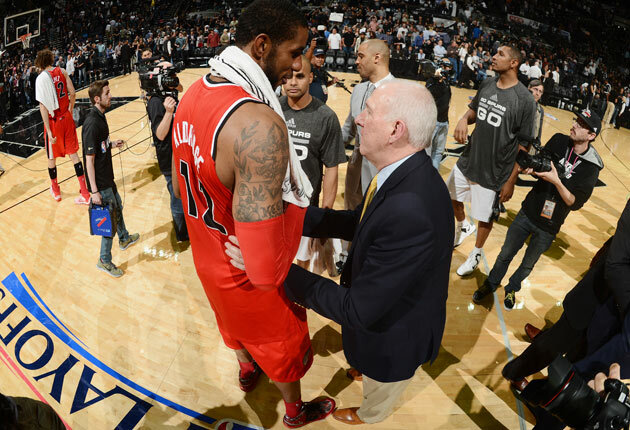 "He's ancient," Aldridge clarified, and the awe came back to his voice. "But he's ancient good." Place the two side-by-side, Duncan and Aldridge, and the reverence is no surprise. Duncan won his first title while Aldridge was in junior high, he won his second title when Aldridge was at Seagoville High School outside Dallas, he won his third title while Aldridge was in college at Texas, he won his fourth title during Aldridge's rookie year, and he won his fifth title after eviscerating Aldridge's Blazers in 2014. Duncan has been winning championships since Aldridge was an adolescent, and he's been doing it in a dignified, all-business, under-the-radar way that Aldridge can appreciate. How does a Lakers PowerPoint presentation or the passing thought of teaming with Greg Monroe really compete with the chance to get a piece of that? Aldridge's decision to leave Portland for San Antonio will go down as this off-season's biggest. He ranked No. 4 on SI.com's "Top 25 Players of 2015" list, and the only other member of the top 14 players to change teams is Jordan, whose Mavericks aren't quite in position to contend for the 2016 title. The Spurs, though, vault right back into the title conversation, joining the Warriors and the Cavaliers at the very top of the list. The Leonard/Aldridge/Duncan frontline is the league's best, and San Antonio's size, length and precision inside will cause nightmares for teams that hope to slide by going small. Offensively, Aldridge and Duncan will be able to alternate between the high and low post, and their big-to-big passing is going to be nothing short of delightful.​ Look for Parker and Aldridge to spend plenty of time in the pick-and-roll, too, with Aldridge's mid-range shooting ability creating space for Duncan in the paint and for San Antonio's shooters on the wings. Popovich will also have the option of pairing Aldridge with Boris Diaw in smaller looks, allowing Aldridge to beast on his preferred left block with four shooters spread out around the perimeter. Importantly, Aldridge's addition didn't require the Spurs to part with ace 3-and-D guard Danny Green, so San Antonio's starting group—one through five—is as balanced and talented as ever (which is saying something). Duncan and Aldridge qualify as a Twin Towers in today's downsized NBA, and the Spurs' defense is going to choke the life out of a lot of opponents next season. When that 2014 series between the Spurs and Blazers ended, Aldridge embraced Duncan, and he went to the podium to say goodbye to another season. "[The Spurs] definitely showed us where we are trying to go," Aldridge said. Many have tried to mimic San Antonio's blueprint, to find success on their level, and many have failed. Duplication wasn't going to happen, so assimilation it is. The easiest way to get where the Spurs are going, it turns out, is to move to San Antonio.